Chess is common called as intelegence game. This game is able for all ages. You can play chess game whereever you want. You just need flat place and a partner for play the chess. Chess equipment including; chess pieces and chess board. You can play chess game indoor, such as in your living room, dinning room, bedroom, loby hotel, school and another room. It also interesting to play chess game outdoor, such as at your garden, backyard, patio area, at beach, and another interesting place. 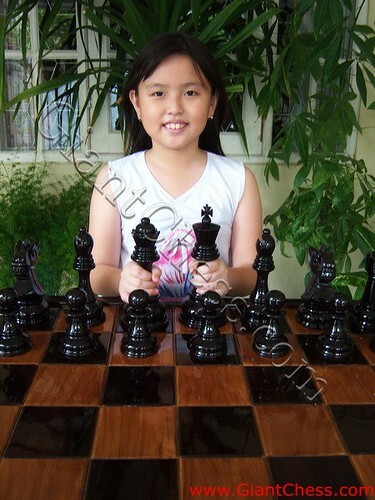 If you want to play outdoor, you will need durable product of chess. We present to you a table chess that made of Teak wood.It is very perfect for outdoor chess game. The main material of Teak wood has high quality, so you do not need to worry about its quality. This chess table usefull for support your outdoor game with your partner. You can left the table at your garden or patio area. Remember that we use the best Teak wood as its main material.